A certain electric potential isoline graph has isolines every 5.0 V. If six of these lines cross a 40 cm path drawn between two points of interest, what is the (magnitude of the average) electric field along this path? This is College Physics Answers with Shaun Dychko. I've drawn two hypothetical points of interest that are separated by a distance of 40 centimeters. And, across is six isolines of electric potential or equal potential lines, as another way of saying that. And, these equal potential lines are each five volts across, and so there's a total difference in potential of five, ten, 15, 20, 25, 30 volts, as you go from A to B. And that's what happens when you cross one, two, three, four, five, six isolines. 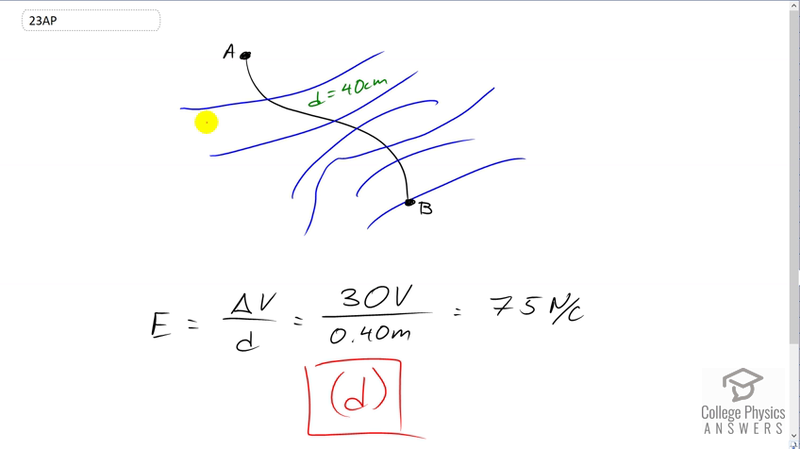 So, the electric field then, on average, is going to be this 30 volts divided by the distance, and that is 0.40 meters. And, you get 75 Newtons per Coulomb, and this for question 23, is option D.